Last week we had the time of our lives as my entire family packed some treats and headed to Newport Beach for a ride on a Duffy Boat. Our adventure took us on a two hour boat ride from Duffy Boat Rentals of Newport Beach. Duffy Boats can accommodate 12 adults (10 comfortably) and come equipped with a CD player and Ipod hookup. I loved being able to bring my Ipod and let the kids play DJ. 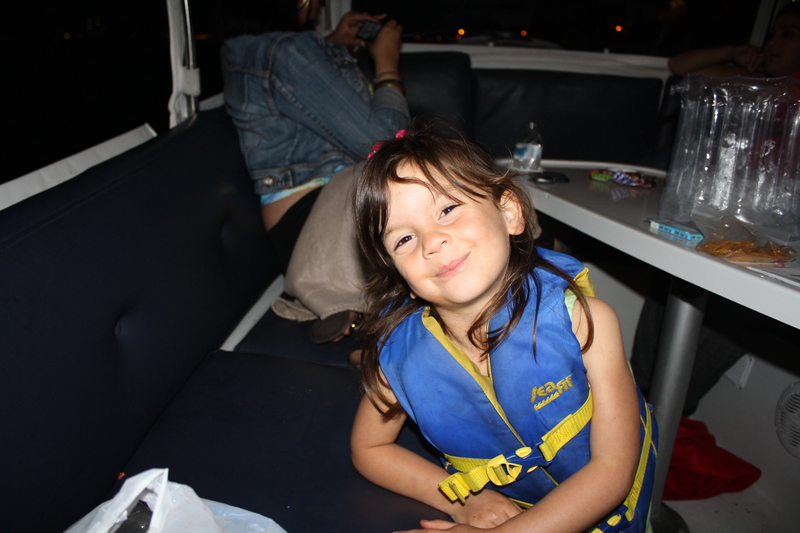 The kiddos loved being on the boat. They were singing, dancing and overall having a great time. My sister let them “drive” the boat and they enjoyed honking the horn (I’m not sure the people inside the beautiful homes did) and watching the sunset. You can bring snacks, drinks and even lunch or dinner. You can also order platters from the local waterfront restaurants and do a “boat-through”. We had a beautiful sunset dinner, that we won’t soon forget. You can also take one of these very fun boats for a spin on any day of the week. 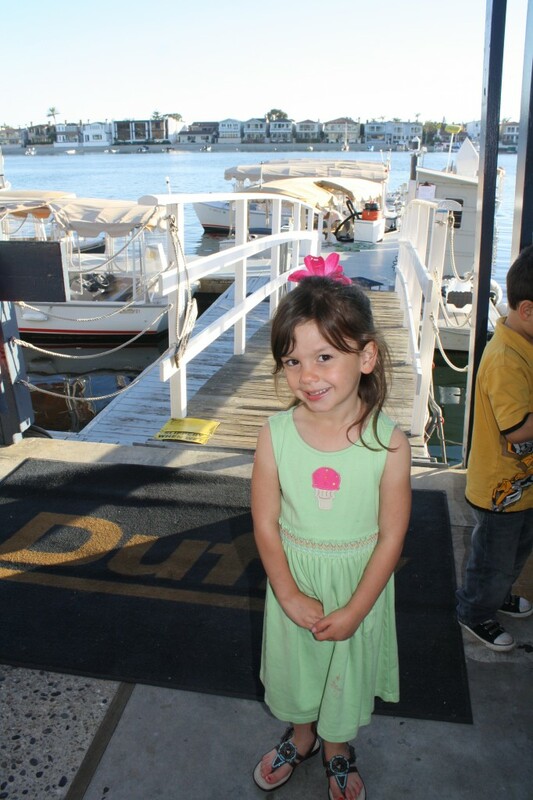 The Duffy Electric Boat Rentals of Newport Beach is open daily from 10am to 8pm. To learn more about their hours and rates head over here. It’s giveaway time! One lucky reader will win a two hour boat rental (Mon-Thu) from Duffy Electric Boat Rentals of Newport Beach. All you have to do is leave a comment letting me know why you would like to win and either “like” Duffy Boats on Facebook or follow @duffynewport on Twitter. For an additional entry do both! Contest closes on Sunday, April 17th at 11:59pm. 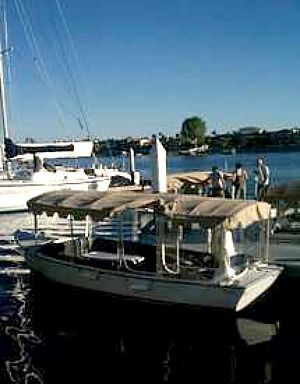 This entry was posted in Uncategorized and tagged Duffy Boat Rentals Newport Beach, Duffy Boats. ← Free Port of Long Beach Harbor Tours are back! I would love to be able to bring my friends and their kiddos to see the beautiful scenery. I would love to take a Duffy boat ride for my hubby’s birthday. I liked Duffy on fb. I’m Liking Duffy Boats on Facebook. My husband suprised me years ago with a Duffy Boat ride. We had a wonderful time crusing the harbor, looking at all the beautiful homes and watching all the seals. Would love to go again and take my kids and In Laws. It would be a great day to remember spending time with Family. Looks like lots of fun. I know that I could round up 10 or 12 family members that would really enjoy a cruise around the Newport Harbor. A Duffy Boat excursion would be a great way to celebrate the end of the year with my fellow teachers and their kids! Teaching and parenting are two of the hardest jobs I have ever done and this year takes the cake! We have had many lose a loved one or experience a family trauma, not to mention saying good-bye to our principal of 19 years! Needless to say…. we are ready for some relaxing! Some of my mom friends and I have been talking about doing this for a much need Mom’s Night Out. It would be great to get to use the boat for free so we could splurge on some delicious dinner and desserts to indulge in while enjoying the views from the Duffy Boat. I “liked” them on FB. I would like to win a cruise around the harbor before our 2nd son is born in 4 weeks. We have a 21 month old who has never been on a boat and taking him on a cruise in the harbor, eating dinner and having a great time before “little brother” gets here would be fantastic! I’d like to win because it would be great to be able to take the hubs, my parents & siblings out to enjoy the scenery and have a great time. What a wonderful time this would be! I would love to do this as a family, pack a picnic basket, & cruise the harbor. 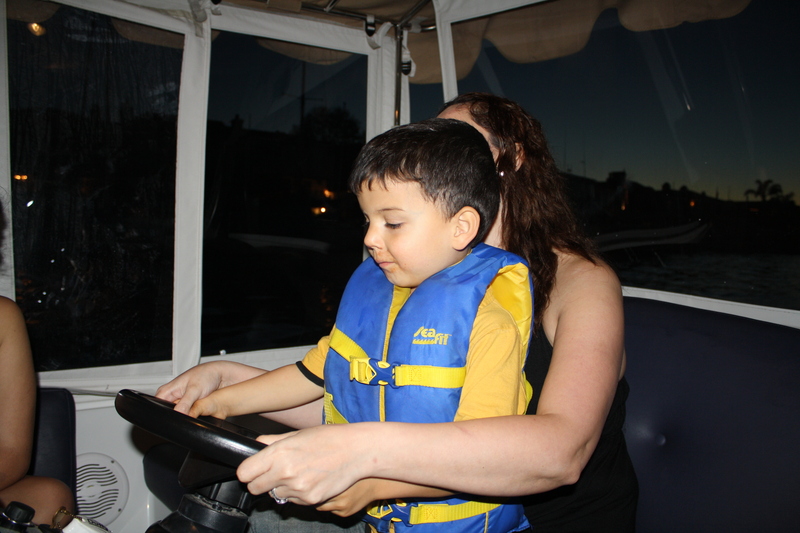 My lil guy loves trains, cars, planes & boats alike….so what a treat to take him on a boat ride! I would love to take my kids. My husband got laid off and we have not been able to do much so I think this is something we can all enjoy. This is the first time I have heard of Duffy and it looks like lots of fun. My family would LOVE to go on a Duffy boat. This is something I’ve always wanted to do and I’ve heard great things! I love that these boats are more kid-friendly than some of the others I’ve seen. What a great opportunity it would be to go with my family for a belated birthday celebration – right in our own backyard! I am following you on Facebook. I was a little confused about how you wanted us to contact you so I left you an email. Sorry if that was a little annoying. I would love to be able to surprise my friends, their kids and my son with an outting like this. Thank you for all of these suggestions! My family would love an excursion like this. We have had a very busy season recently and we could use a fun break together. I would love to win this for our family. This would be a great way to have fun and invite the grandparents too! Thanks! This would be such a cool thing!!! I think my family and friends would really have a great time with this!!! We need to start exploring So Cal…been living here all my life yet, better get to it huh? I liked Duffy on FB…I don’t do twitter, so no double entry! Thanks for the opportunity!! I have a 3 year old who love to “drive” a boat! I just followed on Twitter! Believe it or not, my 4 and 3-year-olds have never been on a boat (well, except a huge ferry) and this would be so much fun with them! Thanks for the chance! I would love to win this to do a Fathers Day celebration for my amazing hubby. My son could help me make a cake to bring on the boat! I also am following duffynewport on twitter! I have three boys under the age of five and they will go crazy if we won. My three year old has been asking to go on a boat ride for his birthday and the Duffy boat would just make his day. My son has been doing so great in school……what a great way to take him out and surprise him for a job well done! The video is a nice touch to your website. Our family loves to do anything on the water and to be able to experience a Duffy Boat excursion in Newport Beach is a added plus. It looks like you and the family had a relaxing and enjoyable time. How fun!! My family loves the ocean and boating. I have heard great things about the Duffy boat rentals and have always wanted to try it. Sounds like so much fun. (I liked Duffy on fb). Sounds like a great time for me and my kids! I am following them on twitter. Thanks! Simply put – it would be great fun, adventure and relaxation for the family in the midst of this nonstop crazy world! Both of my boys birthdays are in April, a duffy boat ride to celebrate their birthdays would be a very memorable adventure for the kiddos. They’d be thrilled!